Grimlock is very excited when he meets another Dinobot just like him. But Scowl is very naughty - and he wants Grimlock to be bad too! Will Grimlock learn not to follow his bad friend? This early reader is specially created with a literacy consultant and is perfect to build reading ability. 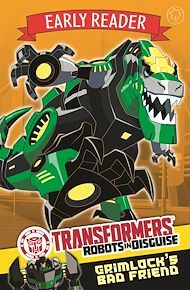 Now even the youngest Transformers fans can read along with their adventures!